Here's a quick summary of the most-clicked links from the @alumnifutures Twitter account this past calendar year. I've written a short description for each, to clarify the content. After all, this is a macro-blog – no 140 character limit here! This March 2010 white paper updated our 2009 look at how alumni organizations could use Twitter effectively. The link opens a page where all Alumni Futures white papers are available. I maintain a list of alumni associations using Twitter. As of January 2011 the list includes 173 organizations (it was 100 when I posted this tweet). A lively debate about the interplay between online and printed alumni notes. 10 comments (including my reactions to readers' replies). I'll be among the faculty for the April, 2011 version. Sign up here: Social Media & Community 2011. Interesting that this was so popular, since there was virtually no discussion about it among advancement professionals, as far as I could tell. I will never tweet about what I had for lunch, but I will share plenty of links to people and ideas that I find informative, provocative, or just plain interesting. And over on Facebook, "Like" Alumni Futures for weekly updates in your Newsfeed. Today I'm excited to announce the publication of a new white paper, co-authored with Elizabeth Allen. The paper is titled Alumni Networks and Twitter: An Update. It's a quick look back at changes since our January 2009 paper, which examined Twitter's potential to influence alumni relations and higher education advancement. We repeated the non-scientific survey on Twitter awareness and usage in alumni relations, so there is now basic comparative data to show changes in Twitter's role in our professions. This year we also added questions about Twitter Lists to the survey. To download the paper (PDF format), click on the link below and the document will be downloaded to your computer. Or use the "Tweet this White Paper" button on the second page of the PDF. Thanks for reading; we hope you find it useful! Is There Value in Your Alumni Network's Long Tail? [o]nline communities won't exist. Electronic interaction will be so completely integrated into all our behavior that we won't think of it as a separate activity, any more than we think of people we talk to on the phone as a "telephone community." But until then, alumni associations are going to find online community software appealing. And as I mentioned last week, two providers of community software have recently published some ideas about social networks. I could probably fill a month of Alumni Futures with comments and thoughts based on these two papers alone, but I'll focus instead on one aspect that connects the two papers: the age distribution of Facebook users (links to each paper are at the end of this posting). In February Harris Connect distributed The Impact of Social Networks on Advancement. Despite the sweeping title, the paper was mostly a preview of how Harris clients could connect their own site to Facebook. Harris reasons that alumni offices should connect their own communities to third-party social networks (an idea that's been around for a while), explains why, and describes a tool for doing that in a special instance (i.e., connecting Harris client sites to Facebook). 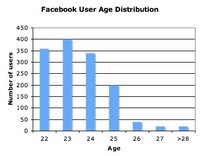 The two distributions look similar, with the youngest users accounting for the vast majority of Facebook users. No surprises there. But seeing the two graphs side by side reminded me of the "Long Tail" described by Chris Anderson. I don't have room here to explain the concept of the Long Tail, but it's well-documented (and disputed) elsewhere. For most of us, it has its most common incarnation in concepts such as "the 80-20 rule." So here's a thought. When alumni professionals talk about Facebook users, we usually presume that all users are equally important to our institutions, and that all are equally valuable network members. A person's a person, right? 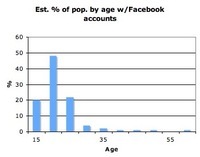 So if the Facebook alumni ratio of 23 year olds to 27 year olds is, say, 20:1 (as in Harris's case study), then the 23 year olds' segment of the alumni network must somehow be 20 times as valuable as the 27 year olds' segment. Right? by and large, greater financial assets. Bottom line: While the number of older Facebook participants is quite small, the potential value they bring to the alumni network is disproportionately large. So don't worry too much about whether older alumni will embrace Facebook (or any other General Interest Community) in larger numbers; instead, think about measuring the cumulative value of the alumni network, and where that value resides within the network. And as usual, that brings us to another huge topic just begging for its own blog posting. So some day we'll ask how to measure the value of an alumni network. I have an idea about that too, and am curious to see what others think. Meanwhile: Is your Facebook network's value hidden in the Long Tail? Are you measuring the value of your alumni networks? How?